For chairmen and CEOs of publicly traded companies, preparing for quarterly conference calls with investor representatives can be a breeze. Or it can be an exercise fraught with worry. Everything depends on how the company has fared during the previous three months. Recently, one of New Orleans’ oldest and largest oil industry service companies faced one of the most difficult calls with investors in its 60-year history. Tidewater Inc. is seen by some as the creator of the offshore “work boat” industry, a business that provides transportation for the people, equipment and supplies that enable Big Oil to operate far offshore in the waters of the Gulf of Mexico, the North Sea and dozens of other international locales that are the stomping grounds of the world’s largest exploration and production companies. Founded in 1956 by members of oilfield innovators, the Laborde family of central Louisiana and chaired for years by John P. Laborde of New Orleans, Tidewater grew into the country’s first and largest offshore service vessel company, sporting a fleet of vessels operating in some 60 countries around the globe. Through the decades, Tidewater adapted its fleet to the changing needs and evolving technology of the drilling and production business. The company also rode out wildly volatile periods in which the fortunes of the oil and gas industry ebbed and flowed. During industry downturns, the service sector is nearly always hit first and hardest in terms of job losses or outright business failures. Right now, Tidewater is closer than it has ever been to such a low. Six months ago, Tidewater CEO Jeff Platt warned that the company could default on part of its debt, even though it had received extensions on payments that were due to some note holders. For months the company struggled to right its plunging financial fortunes, and in late October Tidewater gave notice that a bankruptcy could lie ahead if it’s unable to come to terms with lenders to whom it owes hundreds of millions of dollars. Management explained its plight to investors in early November. Like every other company in every part of the oil and gas industry, Tidewater’s current woes stem from a prolonged depression in the price of oil. After years of floating in the vicinity of $100 a barrel, the price of oil plunged when a glut developed in the worldwide market. Middle Eastern producers, who in past downturns had reduced their production in order to support prices, refused to do so this time because such a step would benefit an increasingly competitive rival producer, the United States. For many months, oil prices have struggled to climb anywhere close to $50 a barrel, a level that industry executives say would help many struggling businesses stay on their feet. And natural gas prices, which have languished for years due to the commodity’s easy availability, have remained at historic lows. The situation has taken a big toll. Some 14,000 Louisiana jobs fell victim to the downturn during the past year, according to state sources, with the bulk of the layoffs occurring in the Lafayette and Houma areas, but with all parts of the state sharing in the pain. Just weeks ago, Lafayette-based Stone Energy Corp. announced a reorganization plan that may allow the company to shed more than $800 million in debt. Industry giant Shell last summer announced plans to cut 2,200 positions across its global businesses, and some of its peers have been forced into even bigger cuts. At Tidewater, which has long been headquartered in downtown New Orleans, the latest downturn spurred a round of cost cutting that has slashed some 3,000 jobs, about a third of the company’s worldwide work force. 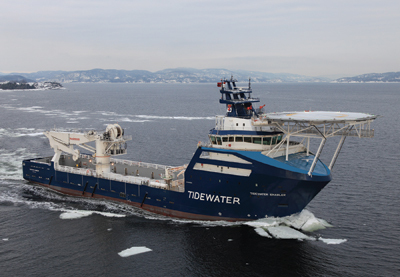 About 180 of Tidewater’s 300 vessels currently are operating in various parts of the globe, according to statements from Tidewater management. That contrasts with peak periods in the past when every one of the company’s boats was actively deployed. With no short-term relief in sight, Tidewater may find protection in bankruptcy court. But as much as management may have hoped to avoid that step, it wouldn’t mark the demise of one of New Orleans’ oldest companies. Under a reorganization plan, Tidewater likely would come to terms with its lenders that would allow for smaller repayments of debt over a longer period of time. Lenders who work with the oil and gas industry know that the business will, at some point, recover to a more viable level, and they have no interest in shutting Tidewater down or foreclosing on a few hundred work boats. The current downturn is one of the worst that Tidewater has ever faced, and it’s certain to cost the company, and New Orleans, more jobs in coming months. But the strength of the oil and gas industry lies in its ability to hold on through the dark times and be ready to spring into action at the first sign of light. Tidewater is more adept than many other oil service companies when it comes to riding out such big economic storms. The company’s fleet of offshore service vessels includes platform supply, anchor-handling towing supply vessels, fast crew supply, offshore tugs and specialty and utility vessels. Tidewater’s operations are focused in four geographic sectors: the Americas, Asia/Pacific Middle East/North Africa and Sub-Saharan Africa/Europe. The company had $980 million in revenue in fiscal 2016, down from $1.5 billion in the previous year.